Moving forward nearly 30 students from the High School #12 of the UAN, San Blas campus, will join the Peace Corps and the Conanp to clean up Playa El Borrego. The 23rd edition of the Riviera Nayarit Beach Cleanup Network is taking place on Saturday, April 9, 2016. The good news is that San Blas is now a part of this eco-social movement. Moving forward, nearly 30 students from High School #12 of the Universidad Autónoma de Nayarit, San Blas campus, will join the Peace Corps and the Conanp to clean up Playa El Borrego. 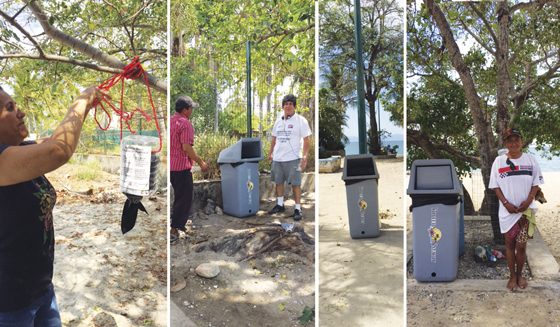 Twelve trashcans donated by Aquaventuras Park will be placed in the Paseo del Arte area in downtown Bucerías and in the Playas de Huanacaxtle region of La Cruz. The petition of Harold Sokolove, a US citizen who has resided in Bucerías for the past few years spurred this donation. The Riviera Nayarit CVB followed up on his initiative so it would come to fruition. The maintenance and care of these trashcans falls on the citizens, the civil associations and the businesses of these towns to guarantee their proper use. Among these are Vista Vallarta Suites, which donated bags for the trashcans, and Banderas Property, which donated the printing of four informational signs to place on the beaches. They will also be installing containers to be filled with plastic bags so visitors to the beach can use them to pick up after themselves.